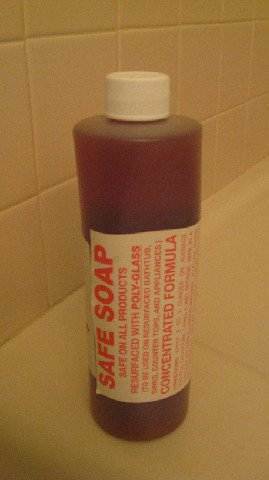 $10 – Safe Soap is a concentrated, non-abrasive cleaner for daily use. Great for refinished tubs to stay looking new! How do I CARE for my newly repaired or refinished tub? NEVER use abrasive cleaners such as Ajax or Comet. Even Soft Scrub is mildly abrasive. Bar Keepers Friend may be used occasionally. Clean your tub after each use and rinse thoroughly to eliminate soap haze that builds up. We recommend that you CLEAN the TUB AFTER EACH USE & rinse it thoroughly to eliminate soap haze buildup. Even though the surface may not look dirty, it should be cleaned at least once a month with a mild liquid soap. Call Todd’s today at 480 835 7070 to order both and have the Technician deliver the day of your refinish!